Home › 3 Pack - Onepurify Water Filter To Replace Samsung Whirlpool Lg Before 2010 M..
3 Pack - Onepurify Water Filter To Replace Samsung Whirlpool Lg Before 2010 M..
3 Pack - OnePurify Water Filter to Replace Samsung, Whirlpool, LG, Before 2010 Model (2-Notch), Aqua Pure, Aqua Pure Plus, DA29-00003, DA29-00003A, DA29-00003A-B, DA29-00003B, DA29-0003B, DA2900003A, DA2900003B, DA61-00159, DA61-00159A, DA61-00159A-B, DA61-159, DA97-06317A, TADA29-00003A, TADA29-00003B, WSS-1, WF289, HAFCU1, 46-9890, 4609890000, 469890, HAFCU1/XAA, HAFIN2/EXP, HAFIN1. 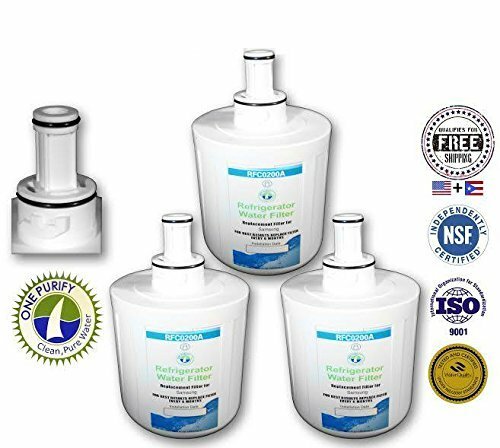 This OnePurify refrigerator water filter contains a compressed carbon blockthat provides tremendous capacity to remove and/or reduce impurities andsediment that may be present in your drinking water. The carbon block hasmillions of active sites on it's surface and within the structure which canabsorb impurities like a sponge, and can absorb and hold other types ofimpurities on its surface like a magnet. Additionally this filter cancatalytically breakdown other impurities very similar to the way a catalyticconverter works in your automobile. These processes ensure that you aregetting the cleanest and best tasting water possible. This filter should notbe used with water that is micro biologically unsafe or of unknown quality,without adequate disinfection before and or after the filter. This filter hasbeen tested by the manufacturer against ANSI/NSF Standard 42 for the reductionof Chlorine Tastes and Odors. MWF compatible filter removes the followingcontaminants: 99.30% of Lead at pH 6.5 99.90% of Lead at pH 8.5 94.50% ofMercury at pH 6.5 96.60% of Mercury at pH 8.5 99.92% of Asbestos 89.60% ofBenzene 99.90% of P-Dichlorobenzene 99.99% of Cysts 98.70% of Carbofuran97.00% of Chlorine 99.10% of Turbidity 97.60% of Particulates (Class I) Allfilters are certified to be free from leaks if properly installed and tofunction with the latest modifications from the OEM. All components NSF-42/53certified. The Activated Carbon Block Filter inside has NSF42/53 approval.The quality of the filter is the same or better than the OEM branded filter. Manufactured in an ISO9001 facility. Technical Specifications: MATERIAL: NSFCoconut shell Activated Carbon; MICRON RATE: 0.5 Micron; OPERATING TEMP. :39-125 degrees Fahrenheit; MAX. OPERATING PRESSURE: 20-120psi; FLOW RATE: 0.8GPM; FILTRATION LIFE: 6 months/300Gal Depends on water quality and level ofcontaminants.